← Tax Denial Satyagraha – Make Handmade Zero GST ! This is not the book of stories of rare men and women of high character, politician or bureaucrat, who arise from the masses and dedicate their lives to understanding and defining the greater and long-term good of society; and then who, selflessly and without personal gain, apply the authority they are given for the sole purpose of making society a better place for the poor in our terribly poor nation. Perhaps these kinds of people exist today only in our deepest desires, and we are left cold with the reality of Ram Varma’s encounters. “Life in the IAS” is a strangely honest read as it never masquerades as anything more than it is – the memoirs of a man who enjoyed wielding power and privilege. “I felt like Akbar…” as an entry-level SDM “relaxing on the wide terrace of his palace at Fatehpur Sikri, listening to music and washing down kebabs with draughts of palace wine”. The book shows us up-close the lives of those corrupted by the money and land they stole from the people, lived fearful lives of intrigue, self-preservation, and the promotion of family. The ego of the politician and bureaucrat often clash throughout the book, but are quickly subsumed by the next phase of mutual exploitation. To the cynical reader, there is little to choose between the two. Written from the vantage point of bureaucrat Ram Varma the book takes us through the political history of Haryana from its founding in 1966, when he joined the IAS, till his retirement as Chief Secretary in 2000. 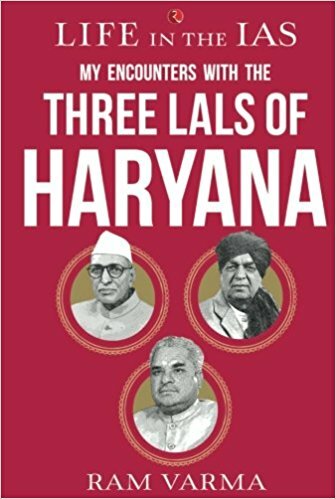 It treats the reader with some juicy reporting on his close encounters with the three famous Lal (and sundry forgettable other) politicians of Haryana, and provides a glimpse into life within the closed club of the powerful India Administrative Service. Varma has an impressive memory, and his easy ability to rough it out in buses like the common man in his early career is pleasantly fresh. He shares multiple instances of his sense of propriety: ruling against Devi Lal’s relative in 1967 as an SDM, ticking off Rao Birendra Singh’s man, calling the seed farm in Hansi to account, walking out on Bhajan Lal, and in general saying no to various politician demands along the way. By his own account, there was no public scam against his name. He comes across as an efficient man of action, taking decisions on merit and not merely on pressure from others, working long hours when required. A notable exception is the absence of a discussion of the root causes of state corruption, or examples of the loot of the state by the 3 infamous Lal’s who are known for it across the fair land of Haryana. Varma was there 34 years, so he hides more than he shares for reasons best known to him. ‘Development’ in India today implies the creation of physical assets and rupee wealth (GDP) per person, perhaps that is all it can mean when we are so terribly poor – and without compassion or imagination. Varma writes “although it achieved notoriety in political defections, bungling in public appointments, low girl-child ration and honour killings, yet on the development index Haryana has achieved spectacular success.” How does a Haryanvi reconcile a high growth rate and the highest GDP with the highest female infanticide rate in India? Agricultural output that leads India, but with unsustainable levels of electricity, water, fertiliser and pesticide application? The lowest forest cover in India? Performance in the spread of schools and colleges, but amongst the worst in children’s learning outcomes? And the stifling force of patriarchy and oppressive caste, both in which Haryana leads India. Then, the multiple instances of special privileges of the IAS and mutual back scratching. Varma is either breathtakingly innocent, or just blasé about this kind of misuse of authority. There is easy access for bureaucrats to luxuries, and the chasm between those serving the common man and the latter becomes deeper and wider: Ahuja, (IAS) Secretary Industries advising Varma ‘… why don’t you buy a car then? I’ll get you a Fiat car from the government quota. Later you can sell it off at a premium.’ (Varma did indeed later purchase a car from the state government quota, we are not informed what he sold it for); the Tehsildar finds land for him to buy and takes him there, his IAS batchmate (the Haryana registrar of Cooperative Societies) advices him to buy the land in his wife’s name and then also proceeds to give the ‘farmer’ wife a loan of Rs. 25,000 to buy the land. In 1975, he accepted a ‘small gold chain with a pendant’ from Bansi Lal’s wife, happy that he ‘received a present instead of giving one’. I don’t recollect some accepting a gift from a politician’s wife without favours in return. Varma was appointed CMD of Central Warehousing Corporation in Delhi it because of an IAS Joint Secretary, a friend who was ‘mainly instrumental in my selection’: so much for job interviews and ability. He travelled to Seoul heading the Haryana Olympic Association (‘I had never even been a piddling player in my college days’); went Washington DC to attend a meeting of the World Bank for a loan, and where he says he contributed zilch: it was ‘grand holiday at state expense in the beautiful capital of the United States’. Not to forget a visit to Israel for developing Fisheries in the landlocked state of Haryana, and a tourist visit to Egypt as a travel bonus. “Bansi Lal allotted me a plot at a prime location in Gurgaon which came handy for meeting the expenses of her (daughter’s) two years stay in London”; another plot in a housing society for IAS officers in Sector 42 Chandigarh, sold for another daughters ostentatious wedding; and at the end of his career he gets another bonanza – Varma is elected President of a new co-operative society for bureaucrats where he is not a member, and is sent the papers for his membership – backdated! “it came my way unasked”. Bansi Lal comes out best, Devi Lal next, and Bhajan Lal is not even a footnote. Varma remains in awe of Bansi Lal, and his penchant for getting things done rubbed off on the young IAS. “For Rao Birendra Singh and Devi Lal power was an end in itself, for Bansi Lal it was a means to an end. He appeared haunted by a vision … to transform his arid native landscape into irrigated fields and pastures”. Bhajan Lal was best at ‘MLA management’ and all that means, and as CM recommended to Varma reinstatement of 100 suspended State Transport Corporation bus conductors on valid grounds of embezzling bus fares from customers. These conductors had bribed to obtain jobs and postings on prime routes, they had to find ways to pay for the bribes. Devi Lal was committed to his rural constituency implementing populist measures of old age pension and farm loan waivers, and actively spreading patronage to his family. The worst he did was give birth to Om Prakash, the one politician who indicated his potential when he was caught at Delhi’s international airport smuggling in wrist watches in 1978. Those of us who live in Gurgaon know how the residential plots along MG Road all converted to malls during his reign. He was caught red-handed in the teacher recruitment scandal and (at 78) is currently undergoing 10 years imprisonment, a first for an Indian politician. There are contradictions in the book for the discerning mind: the upper caste and urban bias in the officer base even 70 years after independence; posts for the IAS that are ‘punishment’ and leave with pay (Secretary, Printing and Stationary); and the IAS looking on itself as ‘man management and overseeing target achievement’. Varma, almost 80 today, writes a book that is worth a read for those seeking in its pages the hidden world of power, exploitation, false prestige and genteel corruption, or just a voyeuristic walk through the tribulations forced on the people of Haryana by politicians who they repeatedly elected and bureaucrats who they did not. You choose the book you want to read. This entry was posted in A Day in The Life and tagged Bansi Lal, Bhajan Lal, Bureaucrats, Devi Lal, Haryana, Haryana Politics, Politicians, Ram Varma. Bookmark the permalink.